Gordon and I had no desire to face another night of head-banging disco. 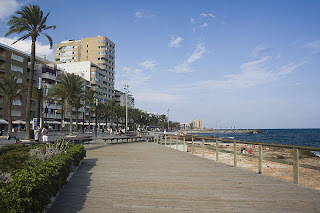 We therefore unanimously agreed to head for Torrevieja, where it was hoped ‘Secant’ would be berthed until September, when the summer heat and tourist season would be finished. We motor-sailed there and found a berth at the Yacht Club. Near the end of our jetty there was a gigantic German superyacht, which was the ugliest yacht I had ever seen. Perhaps she wouldn't have been so ugly, had her deckhouse been smaller. I felt sorry for her permanent crew who had to work hard at maintaining the monstrosity. One crewmember spent about an-hour-and-a-quarter supported in the water by a harness as he cleaned the waterline along the port side! The next day, Thursday, 25th June, was my last chance to look around neibourhood. 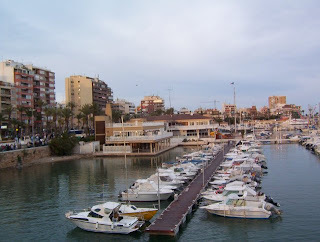 I took a ferry to the island of Tabarca, which we had sailed by while on our way to Torrevieja. An acquaintance of Gordon’s described the Island as, “A building site in the middle of the sea.” I also had a similar impression when I first arrived at the Island’s jetty, but in the course of my exploration, I didn't find any new buildings except in the town. At mid-day the sun broke through the overcast sky, and it became very hot. Seeking shade, I went to one of the numerous cafes where I ate a half-cooked hamburger and drank a Coke. Afterwards, I braved the heat and walked the perimeter of the island. I came across an unused dilapidated church constructed of local red sandstone. It had been fenced off to prevent people from entering, presumably as a safety precaution because of the unstable state of the building. Further along the path I discovered an old well which was covered with ornate tiles. This was a brilliant example of a functional object that had been tastefully decorated in the manner of Spanish folk-art. I was attracted to a group of delightful tiny terraced houses that had not been painted in years, but they were still being used for habitation. 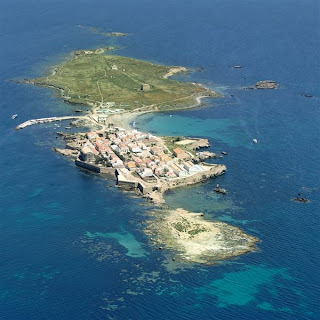 As with other islands, Tabarca had a waste disposal problem. The solution was to dump it away from the town. Piles of unsightly rubbish did nothing to enhance the open spaces of the Island. Most of the beaches away from the town were covered with what looked like layers of bracken. As such, they were not attractive. At the far end of the island, there was a walled-in cemetery, the likes of which I had not seen before. On looking through a small wrought iron gate, I saw stone tombs, some with windows for displaying figurines, photographs and printed texts. 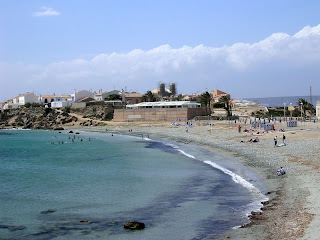 As I continued further, I discovered a beach where I could have a swim, but I did not have my costume. That didn’t matter, because there was no one about, but when I reached the water's edge and undid my belt to remove my trousers, I realized my mini-binoculars had fallen out of their pouch. I would need to retrace my steps, but that was easier said than done, because there were various trails beside the cliffs, and I couldn't be sure which ones I had taken. I returned to the cemetery, as that had been the last place where I had used the binoculars. I had focused the lenses on a two-man catamaran that was going surprisingly fast, especially as there was so little wind. Although I diligently searched the area, I failed to find my much-valued binoculars. This was a great loss. Not only had they cost £50, but they had been a present from my wife. I tried to rationalize the situation by accepting that my loss may be another’s gain – that’s if the binoculars had been found by someone who chanced upon them. Perhaps that person would gain as much pleasure as I had from them? After all, we are only stewards or custodians of what God gives us. He gives and He takes away. Aboard the ferry, on my way back from Tarbaca, I had a conversation with two attractive ladies. They were Swedish, both having a good command of English. I was surprised that they lived with boyfriends, but more so that each of them had three children. They looked far too young for that. One said she was searching for another man with whom she could start a new life, but she had no intention of telling her current partner until she found the right guy. She just wanted a change; meanwhile she had no qualms about deliberately deceiving the fellow she was living with. The other woman was not ashamed that she had been sponging off the State, and she told me she wasn't in a hurry to find employment. When I reasoned with her, she grudgingly accepted that paying for her own keep may not be a bad idea. Her mother had a villa, a few kilometers up the coast, and she wasn't too short of money. Perhaps that was why this young lady was not unduly worried about getting a job? After all, her mother could help out! Did she have any conscience or understanding of her moral responsibility? I think not. That night, Gordon and I dined out. We ate at restaurant that was featured in his Michelin Guide which happened to adjoin the Yacht Club. From our vantage point on the veranda, we had a full view of the harbour. We took our time to savour the various delicacies. I had a swordfish steak that had been marinated in wine, served with parsley sauce. It was absolutely delicious. Surprise! Surprise! Most diners there were British. The meal was a fitting way to end our cruise, but all wasn't over. Friday, 26th June finally arrived, which was the day of my return flight to Heathrow. One of my schoolteachers taught me that it was good to make sure that when you borrow something, you should return it in the same condition, or if possible, in a better state than when you received it. As I had borrowed ‘Secant 's’ aft cabin, complete with its double berth for thirty-eight days and nights, I wanted to leave it clean and tidy. Therefore I spent time removing numerous bloody stains on the walls of the cabin, where the not-so-clever mosquitoes had met their timely deaths, by courtesy of my Pilgrim's Progress paperback! Also it seemed right that I should launder the sleeping bag that had been loaned to me, but for some reason the washing machine in the Yacht Club’s launderette stopped, and I unthinkingly opened the door for a brief moment which allowed water to spill onto the floor. A lady assistant kindly mopped up the spillage and efficiently restarted the machine. Later, when I went to retrieve the sleeping bag from the drier there was the most enormous cockroach between me and the machine. This creature faced me head-on, raised his feelers, stared; then charged! Not wanting to be judge, jury and executioner, I had compassion and fled the scene. Later, when I returned to the drier to retrieve Gordon’s sleeping bag, the creature was no longer there. Mid-day was the designated time for me to abandon ship, and with the help of the skipper who carried my bag, I walked to the Yacht Club, where the receptionist tried ordering a taxi, but the phone was permanently engaged. Therefore Gordon and I walked about a quarter of a mile to the nearest taxi rank where a cab drew up. Gordon said it had been a memorable cruise. After saying goodbye, I was driven at high speed to Alicante Airport. My flight to Heathrow was aboard an Iberian Airways plane. I had plenty of leg room, enjoyed good food and found the service excellent all-round. As the aircraft soared to 15,000 feet I reminisced on my Mediterranean adventure; then my thoughts turned to home which was a different world. Gordon's parting words were true. It had been, in MEMORABLE cruise.